Who is the best solar company in Brisbane? 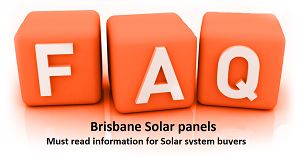 You Are Here: Home / SOLAR NEWS: Our Blog / Uncategorized / Who is the best solar company in Brisbane? Why is QLD Solar and Lighting best solar company in Brisbane? When a customer begins looking for solar power systems their main concern is to ultimately, at the end of their solar research is to stumble across what they hope to be the best solar company in Brisbane. We know that a customer is searching for the best products at the best price. We know this, because they tell us this. We always try to offer the best value solar systems for sale in the South East Queensland region of Australia. Queensland solar offer the best warranties on the market. This being a 10 year workmanship warranty. The reason why we can offer such a fantastic workmanship warranty on the solar install is because we use our own ‘in-house electricians’ as solar installers. Whereas other solar companies take advantage of the cheap labour on hire from local solar subcontractor installers who offer their services or an extremely cheap price. One thing we all know that as you pay peanuts, you will get monkeys. We simply cannot offer a 10 year workmanship warranty if we have no idea how a foreign solar subcontractor does their install, and the quality of their work. This is why we ensure to only use in-house installers who are employees, as we can personally guarantee their work. We know that they do a good job. If they did a poor job – they would be fired, simple as that! Queensland solar and very rarely pays money for advertising. Most of our happy solar customers who find us, do so from running a solar search on the Internet. Isn’t that how you found us? Our website only costs us $50 per year to run. And when we get about five solar customers every week from the website that adds up to be quite a substantial saving for us on marketing fees. So what we do, is offer the best price that we can. We truly pass the savings on to you guys, the customer. We have been around long enough to know what products are cheap and nasty, and what products will most likely stand the test of time. Like everyone, Queensland solar love a bargain also. And it’s hard not to be drawn into incredible crazy prices fall solar equipment, panels, inverters and components. You need to remember, we shop for solar products just as you residential and commercial customers do. The only difference is you guys shop for retail solar systems, and we shop for wholesale solar products to then sell on to you. There’s not too much difference there – if we get burnt, you get burnt. Unfortunately, but also fortunately for you, is the fact that we have been caught out by being caught up in all the ‘cheap deals’ from wholesalers also. We once stocked JFY solar inverters – something we wholeheartedly regret. Hindsight is a tremendous thing. Some customers were left out without an inverter for up to 2 months, as JFY went missing in action and were not cooperating with replacing customers faulty inverters. But in the end, all customers were replaced with working solar inverters, but at least they had learnt what a ‘cheaper product’ now usually means. Poorer service and reliability. Because we have been in the solar industry in Brisbane and the surrounding regions for so long we know solar power like the back of our hands. We have accumulated a wealth of knowledge on what solar brands and types work best in the local region. We know what a customer in Brisbane is predominantly after, and offer to share heaps of valuable tips and tricks that we have learnt from competitors in the local Brisbane solar industry that we love to share with you. You can search the web, and trawl through pages and pages of competitors websites but you will never find anything quite like this one. This website is definitely unique, in the fact that it breaks down the overcomplicated solar panel data sheet and technical talk mumbo-jumbo and put it so it can be easily understood into layman’s terms. How do we know this? Because we are told time and time again from our customers. This approach sure beats the hell out of a solar company not answering their fines or emails when problems really occur, like a faulty solar inverter for example. We are a local company, you can come and visit our office any time you wish. We install not only using reputable solar panel and solar inverter brands, but also state-of-the-art installation components. For example,we use Grace Solar and Antai Solar racking ZJBeny isolators. You can read more about how we do our install here. Still not convinced Qld Solar and Lighting is the best solar company in Brisbane and Gold Coast? request a free quote from us and see what we can do for you!